Taher Asad-Bakhtiari is a self-taught artist whose practice revolves around objects, textiles, and experiences, among others. Born in 1982, Asad-Bakhtiari studied in Canada and Switzerland, currently residing in Dubai and New York. His bodies of work explore his heritage, including the kilim weavings of the Bakhtiari tribe as well as oil barrels referencing his status as a part of the generation of "oil babies." Asad-Bakhtiari's "The Tribal Weave Project" is his attempt to revive and reinvent a disappearing cultural craft, while "Recovered Barrels" takes a ubiquitous sight throughout the Middle East, repurposing them yet retaining their multipurpose nature. 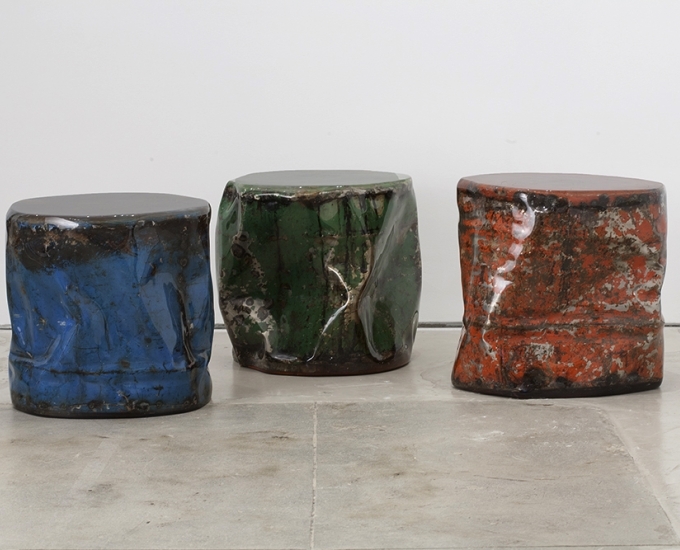 About his "Recovered Barrels," Asad-Bakhtiari explains, "Cleaned and all spruced up, the finished products are a cross between recycled art, environmental art, and upcycle. Each one is unique in style and color and continue to be multi-functional. Rescued from a fate of total destruction, the barrels tell a story of diversion, barter, overcoming resistance, metamorphosis, and recovery. As such, they stand as a testament to Iran's modern and torturous history: from riches to dust, from shiny new to battered and barely surviving, from frivolity to austerity and then slow re-conversion.... [they] stand as a subtle reminder that in a city of extremes, it is the simple things that tell the biggest stories." Regarding his "Tribal Weaves," Asad-Bakhtiari states, "My tenuous yet deep-rooted connection with the Bakhtiari tribe motivates me to support this dying craft, and I draw inspiration from their unique artistic legacy... Kilims were true raw expressions of a tribe's outlook on beauty. With the demise of tribal life, that type of art has died. What has not is the technique, and I believe the survival of this craft goes through reinvention." For his kilim and the gabbeh pieces, Asad-Bakhtiari takes the fundamentals of the historical technique, stripping them down to reveal the lace-like texture of the underlying warp, as well as enhancing the traditional geometric shapes, emphasizing the design but also the uniqueness of the medium.